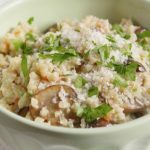 This creamy mushroom cauliflower risotto is the perfect keto and low carb side dish. In just 30 minutes, you will have the taste of a creamy and delicious side dish without any rice! Chop florets and place in a food processor. Process them until they’re about the size of couscous. In a pan or small pot, cook garlic and mushrooms in a tablespoon of olive oil over medium heat. When the garlic is fragrant, add chicken broth and your riced cauliflower. Stir very well. Lower the heat so that the whole dish simmers and cover. Let steam for 5-7 minutes. After the cauliflower has cooked a bit, remove the cover and let some of the chicken broth evaporate and cook the cauliflower more. This should take about 5-10 minutes. Once there is no moisture at the bottom of the pan when stirred, add the heavy cream, parmesan cheese and your spices. Stir until parmesan has melted and serve.